Authorisation Code Dialling allows you to make calls from shared phones in communal spaces without needing to log in. Contact your Site Manager to find out if Authorisation Code Dialling has been set up for any phones in your site. Calls to Reception and Emergency numbers do not require a code to be entered. 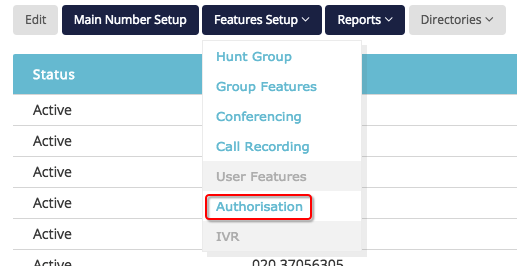 To use Authorisation Code Dialling, you will need to enter an Authorisation Code. This code is unique to your company. The Authorisation Code can be found by navigating to Telephone Manager. In the Features Setup menu, select Authorisation to view your code. When you pick up a phone that has been assigned Authorisation Code Dialling, you will be prompted to enter this code before you can make outbound calls.